Looking to strategically advance your business with innovative ideas and partnerships? This forum brings together the best wedding professionals in and around Page County. The intimate atmosphere allows for a free exchange of ideas as well as the chance to make lasting connections with peers in the wedding industry. You will leave with innovative ideas and long-lasting partnerships. It’s about connection and community, not competition. After all, TLC named Luray the #2 Most Beautiful Destination Wedding Locale in the United States! 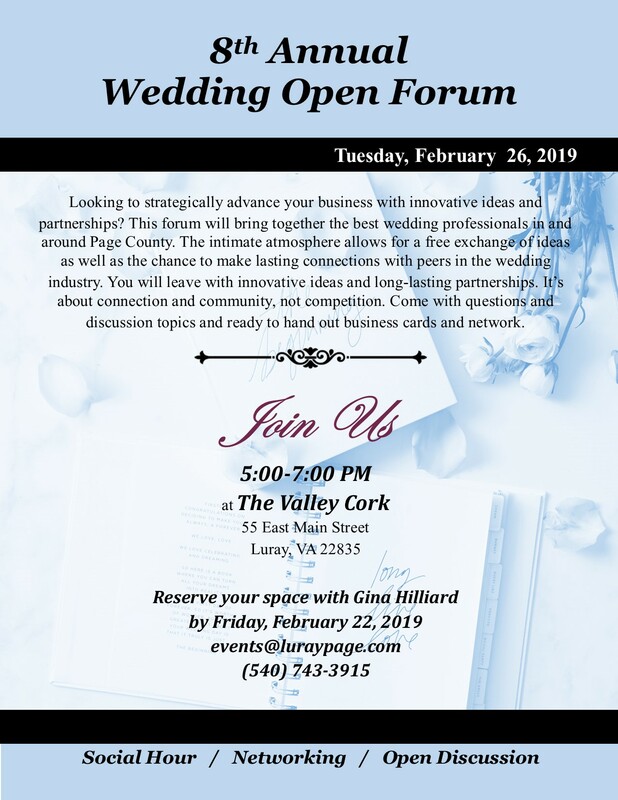 This yearly event is held at the end of February and the 2019 event is scheduled for Tuesday, February 26th from 5:00-7:00 PM at The Valley Cork. This hugely successful event included lots of ideas for group attendance at bridal shows, marketing, the needs of the wedding community, and more! We look forward to catching up with everyone and seeing new faces at the 2019 event.